Be prepared to be lifted-up—quite possibly to the heavens—by merely viewing this euphoric musical performance by the Queen of Soul Aretha Franklin. Never before seen footage is restored that document a historic recording event that produced her most personal record album, it also became her most popular release, landing certified double platinum, and the biggest-selling album of her career as well as the best-selling gospel album of all time. Aretha Franklin, January 1972, in her prime, age 29, had already established herself as a musical sensation; she’d won five Grammys and had 11 No. 1 singles on the Billboards charts. For her 21st album, she desired to create a Gospel album that exemplified her life-long faith, while paying tribute to her mentor, Dr. Reverend James Cleveland, known as the King of Gospel music. 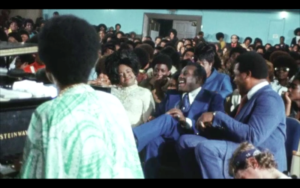 What transpired was a spiritual two-evening recording session at the New Temple Missionary Baptist Church in Watts, California complete with Cleveland, the Southern California Community Choir, a lively audience, Clara Ward, her father Reverend C.L. Franklin and celebrities’ Mick Jagger and Charlie Watts. Warner Brothers had agreed to make a feature film of the sessions in hopes of coat-tailing on the success of the movie “Woodstock” (1970). Unfortunately, director Sydney Pollack when filming didn’t have the needed post-synched back-lot sound co-occurring; as a result, with no clappers, or no marks to synch the film it became an impossible task to match. The hired lip readers and special editors at the time came up empty-handed. 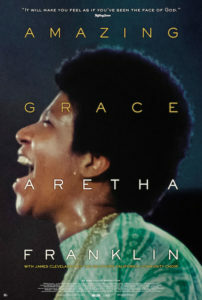 In 1990 Alan Elliott the newly appointed staff producer/ Artists and Repertoire representative at Atlantic Records heard the story of “Amazing Grace” which set Elliott on a determined mission. Together, Elliott, Atlanta Records Executive, Jerry Wexler, and Sidney Pollack approached Warner Brothers about using new digital technology to match the sound to picture and make a feature film out of the raw footage. 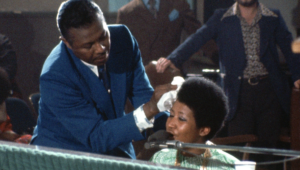 Forty-seven years later, the film serves as a historical time capsule and a genuine statement to the magnitude of Aretha Franklin. It’s wonderful to see her at the piano as this gifted artist is more known for her singing abilities. Appearing stoic towards the audience, it’s as if she’s enthralled with her own personal spiritualism. The energy she displays during the songs looks exhausting, and the hot set lights don’t help the heat element of the church. Her brow and face have noticeable beads of sweat beginning with the first song, continuing until the end of the performance. As she rests between songs, there’s a quiet presence to her; it’s as if she’s taken Reverend’s Cleveland’s words to heart. Perhaps the most touching scene occurs after listening to her father Reverend C. L. Franklin speak about her as a child prodigy. You see, they traveled together when she was 11 years of age performing gospel in different churches across the country. He spoke of her gifts being her spirit and enthusiasm and of course her voice; yet, her uncanny musical ear helped her synthesize each of her mentors sounds—Dr. Reverend James Cleveland, Mahalia Jackson and Clara Ward shaped her distinctive style. 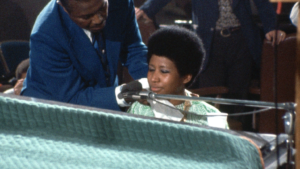 After her father’s tribute, Aretha begins to play the piano, and her father can be seen lovingly wiping her brow and face as she plays. Their personal moment is for all to see, and you can’t help but feel chills from viewing the interaction. Truly a beautiful moment, I loved it. 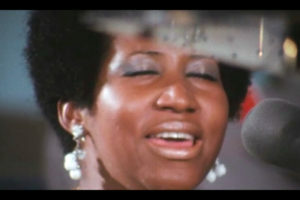 Aretha Franklin could sing anything and, could sing of a love, which softens the borderlines amid a religious love and a romantic one. Her medley of “Precious Lord, Take My Hand,” and Carole King’s “You’ve Got a Friend” chips at the walls between faith and love, which is uncanny. We experience new emotions as she transcends us into her world of faith. One can’t help but be moved, as she appears almost to glow as she closes her eyes and sweetly sings of her Lord. Her father said of her voice, “It’s that indescribable something that is hard to describe.” Yes, I’d agree, her voice is indescribable. It’s no wonder that her family was overcome with joy as Alan Elliott held a private screening of the film for her family.